Dedicated to the energy transition, BePOSITIVE fair is a real meeting platform for building companies, climatic engineers and ENRs. In parallel with the BePOSITIVE fair, EURAFRIC Forum, organised by the ADEA - Business Development Agency in Africa - promotes collaborations between European and African companies in the energy transition sector with particular focus on water issues, energy, renewable energies and the sustainable city. In this profoundly changing environment, Turbiwatt will present its innovative low-head turbine solutions that provide high-performance and cost-effective response in this high potential and untapped market to this day. They are installed run of the rivers, in canals (mills, locks, valves, etc.) or in industrial sites that use or treat water (drinking water and wastewater, agri-food, chemistry, stationery, mines, breweries, etc ...). It is also an answer adapted to isolated sites that can benefit from green energy without network infrastructures. Deployed around 3 models, Turbiwatt covers projects from 1.20 m to 7 m heads and from 70 l / s to 4 m3 / s. It covers a power range from 1 to 130 kW. Turbiteam is waiting for you on booth # 6T08 / Hall 6.2 in front of the EURAFRIC Forum area ! Turbiwatt has designed and developed a concept of low-cost, high-efficiency hydroelectric turbines dedicated exclusively to low heads and low & medium flows. Deployed around 3 models, the Turbiwatt range covers projects from 1.20 m to 7 m heads and from 70 l / s to 4 m3 / s. It covers a power range from 1 to 130 kW. Turbiwatt brings with its innovation a powerful and profitable solution in a market niche with very high potential and untapped until today. Small Hydro Latin America will bring together developers, investors, producers, distributors, and service and equipment providers from across the LATAM region. The Turbiteam is waiting for you on the booth # 51 ! The purpose of this call for projects was to propose simple solutions to generate electricity (generated power up to 100 kW) by using the power of rivers and streams. - Have a low impact on the aquatic and fish environment, which will allow the recognition of ichtyo compatibility. - Easy to install, limited civil work requirements and easily connected to the grid. Turbiwatt's micro-hydropower solutions have earned them the title of Laureate for this call for projects. 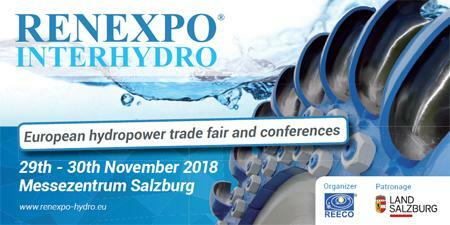 Turbiwatt, French designer and manufacturer of low head micro hydroelectric turbines, announces its participation in RENEXPO® INTERHYDRO, which will be organised on the 29th-30th of November at the Salzburg Exhibition Center, in Austria. The growing interest in the development of hydropower has made this show a unique platform for the entire hydroelectric industry to present, transfer knowledge and exchange experiences. RENEXPO® INTERHYDRO will focus on energy, power generation, hydropower, hydropower engineering, water protection and conservation. As a committed player in the energy transition field, Turbiwatt will be happy to welcome you on its booth #K10, to present you its hydroelectric solutions, to help you evaluate the potential of your site and to determine the optimal solution for its implementation. This speech will enable Turbiwatt to present its hydroelectric technology and micro turbines, to demonstrate the high profitability and performance they can offer and the great energy potential of low heads, a market niche currently untapped ! Turbiwatt, French designer and manufacturer of low head micro hydroelectric turbines, is pleased to announce you its participation at Key Energy; the largest international fair for green & circular economy and renewable energies in the Euro-Mediterranean area. According to the Kyoto Protocol and in accordance with resources and environment safeguarding policy, Key Energy aims to put the issue of sustainable energy at the heart of the debate on the industrial development of our economic and social system. It covers all sectors of the circular economy: from equipment and energy recovery to sustainable development. The circular economy and the development of renewable energies are two of the major changes underway in the world of the green economy. As a committed player in the energy transition field, Turbiwatt will be really happy to welcome you on its booth #019 (In Pav n°B5) to present you its hydroelectric solutions, help you evaluate the potential of your site and determine the optimal solution for its implementation. The Turbiteam is waiting for you !